It was a good flight from Denver. We arrived about 3:00pm and Al was right there to bring us to the boat. He had spent the morning with a mechanic working on the inboard and the boat was ready to go. 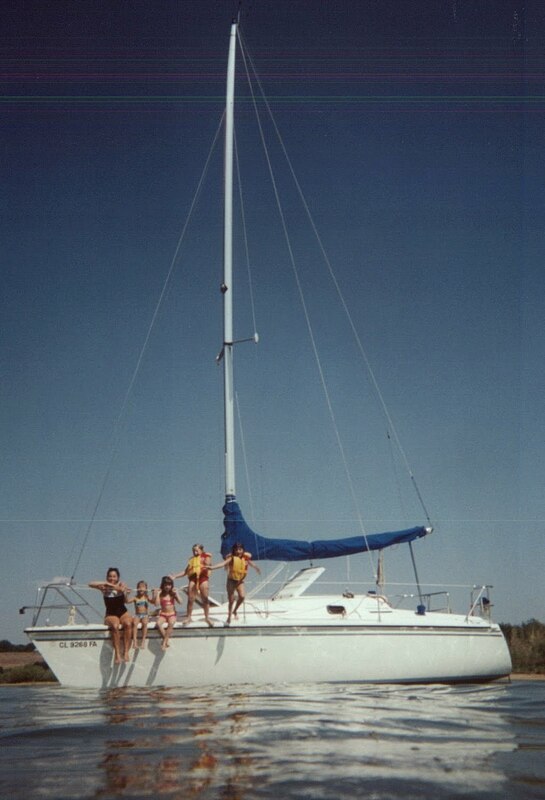 Rose had no trouble feeling at home and explored every inch of this beautiful 28 foot Pearson. It’s only 20 inches longer than the Hunter but it weighs twice as much and is seaworthy in every respect. Al has spent allot of time making this “his” boat and the attention to details shows. While Rosy was rooting around the boat we looked at Al’s pictures of our Bahama trip. The weather is cool and cloudy…still comfortable. The Chicago skyline is striking against the iron grey sky and in places the tallest skyscrapers are poking into the clouds. When Laura (Al’s new girlfriend) came aboard she made an instant friend out of Rosy when she gave her a pretty package of fancy candy with a fabric rose sewn to the box. We chatted a bit and Al & Laura took of for the evening. Paula , Rose and I took a taxi to the famous Navy Pier and wandered around taking in the attractions … boat rentals…3d movies…Ferris Wheel…bike rentals…you can find it all on the Navy Pier. We had dinner at the BeBop Cafe…Live Jazz and Good Food! About 10:00pm we headed back to the yacht and got ready for bed. Burnham Harbor…We are waiting for Al to show up and plan to sail to Hammond Indiana. The winds are strong out of the North. I’m sure we will be using the preventer and probably not the Genoa. What a great day sail! rather than go to Hammond we went out and tooled around the area. the winds had the Pearson on her beam most of the way. The seasickness meds are working well for Paula but Rosy is not feeling so well. Neither can go below The seas are choppy close to shore and 3 to 6 feet outside the sea wall. While Al is off taking care of business the girls and I went back to Navy Pier to play. Rose and I took in the 3d fun ride and the Voyager Flight Simulator. All of us rode the Ferris Wheel that towered over the Pier. Tonight we ate at the Famous Billie Goat Tavern. You could almost see John Beluchi crying Hamborgor…Hamborgor… Pepsi no Coke…No fries…chips. Right now Paula is on deck reading her book, Rose is below playing with fractionals and I’m going to start getting the boat ready to sail. The Barometer is steady at 30.20 inches. 8/13/03 We are at Hammond. Yesterday the wind picked up to a 25 knot norther and the only safe and comfortable way down here was to motor. What a ride! Huge trailing seas, Rosy stayed on deck for about 45 minutes saying Whee! and telling us it was better than a roller coaster. Then abruptly she decided to go below where I built her a little nest in the forberth and she was asleep in no time. Paula really surprised me. She just layed back against the starboard companionway occasionally taking pictures. No complaints. We passed a sea wall about 45 minutes before arriving and the seas settled right down. After putting in we went to the Casino Boat for a huge Buffet dinner. At 10:00 we returned to the boat and crashed. The winds are strong and northerly but beginning to come down and clocking around to the East. Time for bed. 12:30pm Bar 30.40 rising… Back at Burnham Harbor after a beautiful “one tack” sail back from Hammond. Strong breeze from the north allowed us to follow yesterdays track all the way home. Rosy bounced all over the boat and ended up sleeping on the companionway. Paula stayed at her starboard station the whole time. When she went below for a “head stop”, she started feeling seasick in about 30 seconds and felt poorly until we put in. Al and I stopped at the fuel dock to “fill and dump” Paula walked around to H dock just in time to take out picture coming in to the slip. 4:20pm Bar 30.35 dropping… Just got back from visiting the Planetarium and the Aquarium. Lunch was at Galileo’s, it was tasty and the view of Chicago Lakeside was beautiful. We went to the dolphin show and wandered around the exhibits probably seeing about 50%. I wanted to see the shark exhibit but the line was too long. We did get into the Caribbean Exhibit which was extensive, Bonehead, shark, manta rays, Angelfish etc. Now we are back onboard. Paula is on deck reading, Rose is below watching a DVD and I’m getting ready to pick-up and maybe start the new Clancy novel. About 5:30 we took a taxi to the Tuscany Restaurant on Taylor Street. It was a classic slice of the Chicago Italian District. There was even a Italian “Tough Guy” Social club. Paula had Gnocchi and I filled up on Ravioli. After dinner we strolled up Tailor to Mario’s Italian Ice where Rosy had watermelon ice and I bought a $15 cigar for Al. I was feeling very close to my “Ol Man” and bought a pack of Toscaninis which I’ll probably never smoke. Al met us back at La Sabrosa and we made short order getting out of the slip. I was surprised by the large amount of traffic in the causeway. We threaded our way out of the harbor and set sail and headed north along the Chicago Skyline. Paula took a few long exposer shots and rose went below to play with her toys. The mystery of the high traffic was solved when Al remembered that tonight was going to be a fireworks display. NICE SHOW! I tried to wake Rosy but after carrying her up the companionway she took one look ….said “cool…now I want to go back to bed”. When the fireworks were over we unfurled the Genoa and sailed east into a beautiful full moon. At 11:45 we put in and went right to bed. This morning I woke early and took a shower while Paula packed. Al picked us up and the 4 of us went to breakfast at a place called the Fox & Oble. Later we took a 90 minute “Architectual cruise” courtesy of Al’s slip neighbor Bill who is the Captain. What a city! My favorite buildings are the NBC building and the Tribune building. After the tourist cruise Al took us back to the Airport. It has been a wonderful trip! Rosy was wonderful and so was Paula.